In general, I don’t try to recreate restaurant recipes. While there have been a few that turned out well (like my Thai pizza), most of the time they don’t seem to measure up. It’s easier to just go to the restaurant in question and have the real thing. Unfortunately, one of my favorite vegetable dishes was one we had in Japan, at a completely tourist-y ninja-themed restaurant. (Really, I don’t understand why there aren’t more restaurants with ninjas as waiters. Also, the ninjas did magic tricks.) It was so simple, only consisting of a miso-based sauce and steamed vegetables. But it was so good. My first few attempts at replicating the sauce resulted in salty, barely edible disasters. But this time I got it right! I realized that my version was missing the sweetness of the original and that I needed to add sugar. I used different vegetables than we had in Japan (summer squash, since it’s that time of year) and grilled them instead of steaming them. 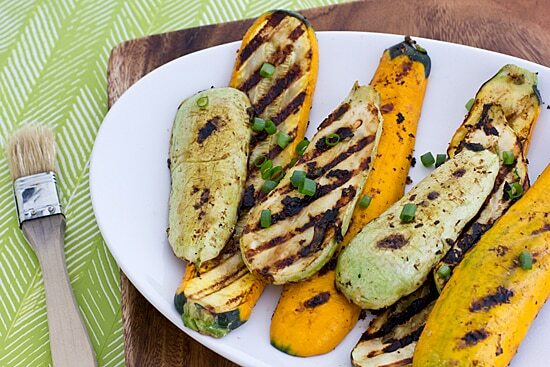 This grilled summer squash recipe couldn’t be easier, so it’s a perfect way to use fresh zucchini from the garden. A Japanese-inspired miso marinade turns summer squash into something special! Whisk together the first 4 ingredients in a small bowl until well-combined. In a large zip-top bag, combine squash, green onions, and sauce. Toss bag until squash slices are coated with sauce. Put bag in refrigerator, tossing hourly, for 4 hours. Lightly oil grill and heat to medium. Lay squash slices on grill and brush with leftover sauce. Cook until browned on bottom, about 4 minutes. Turn over, brush with remaining leftover sauce, and cook for another 4 minutes (or until browned). I'm sending this to my husband – we need to make this one! This sounds so fancy yet easy! I need to try this. I just need to buy most of the ingredients. Vibrant Wellness Journal | Holistic health, clean living, healthy recipes!